CarPro Systems is a comprehensive ERP that unifies all aspects of car rental management into a single platform. With its tools and functionalities, businesses are empowered to expand their operations and take more steps toward globalization. And as CarPro Systems has a wide spectrum of features, vehicle rental operators are further enabled to enhance their services for them to keep on delighting their customers. One of the things that make it possible is the integrated customer relationship management module that aid users in building strong bonds with their clientele. Also, CarPro Systems assists businesses in maintaining their leverage over their competition through continually updated tools and additional innovative features. CarPro Systems enables car rental businesses to connect their fragmented operations. With its centralized database, users can swiftly generate the information they require exactly when they need it. Aside from that, this connectivity promotes productivity among working personnel, streamlining of business processes, and maximization of resources. Data entered into the system can be crucial in offering the most optimal services to a customer. CarPro Systems work to transform pieces of information provided by the built-in CRM and the other components of the software into actionable insights that empower users to make intelligent decisions. CarPro Systems is equipped with functionalities that show vehicle rental companies the bi-directional cash flows—incomes and expenses. As such, users can maximize this information to control the outflow and take full advantage of their short-term rent contracts and long-term leases. With CarPro Systems, businesses can make certain every unit in their fleet is well-maintained. Through the fleet control window, users can track its utilization, damages, servicing, and the related costs. This enables to carefully plan management of every unit to make sure it is always road-worthy for the business to capitalize on their availability and demand. Regardless of the conditions pre-configured or set on-the-fly, CarPro Systems deftly adapts to them to provide the best and most attractive rates to customers. This includes generating fees for chauffeur and vehicle rental quotations as well as personalized agreements for improved front-desk efficiency and boosted customer satisfaction. Customers like expediency. That is something CarPro Systems understands, which is why the solution includes a self-service reservation and management portal. Through the website, interested patrons can schedule a vehicle rent and specify the car they wish to drive and whether or not they require a chauffeur. With this, waiting time for bookings is reduced and customers feel they have an ounce of control over their transactions. If you are interested in CarPro Systems it may also be beneficial to investigate other subcategories of Best Car Rental Software collected in our base of B2B software reviews. There are well-liked and widely used solutions in each software group. But are they essentially the best fit for your enterprise’s unique wants? A popular software solution may have thousands of users, but does it offer what you need? For this reason, do not blindly shell out for popular systems. 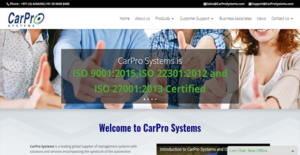 Read at least a few CarPro Systems reviews and mull over the factors that you desire in the software such as the price, main functionality, available integrations etc. Then, shortlist a few solutions that fit your needs. Try out the free trials of these platforms, read online opinions, get information from the vendor, and do your homework systematically. This in-depth homework is certain to help you select the finest software platform for your organization’s specific wants. How Much Does CarPro Systems Cost? CarPro Systems is a leading provider of car rental software based in India. Those interested in the solution can request a custom quote from sales by phone, email, or web form. We realize that when you make a decision to buy Car Rental Software it’s important not only to see how experts evaluate it in their reviews, but also to find out if the real people and companies that buy it are actually satisfied with the product. That’s why we’ve created our behavior-based Customer Satisfaction Algorithm™ that gathers customer reviews, comments and CarPro Systems reviews across a wide range of social media sites. The data is then presented in an easy to digest form showing how many people had positive and negative experience with CarPro Systems. With that information at hand you should be equipped to make an informed buying decision that you won’t regret. What are CarPro Systems pricing details? What integrations are available for CarPro Systems? If you need more information about CarPro Systems or you simply have a question let us know what you need and we’ll forward your request directly to the vendor.